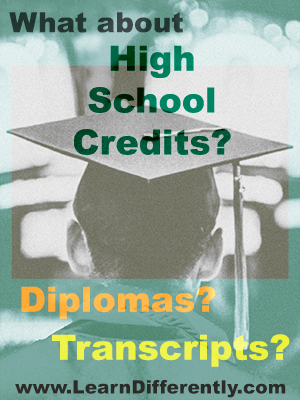 What about High School Credits, Diplomas, and Transcripts? By Kathy Kuhl When I speak on homeschooling high school students with learning challenges, parents often ask: What about transcripts? 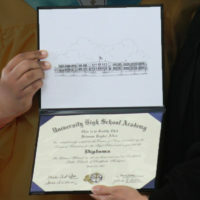 How do I decide when and whether to give a diploma? Do you ever worry that your student will not be able to do the work of high school EVER and then think they probably won’t pass GED no matter how hard they try? I’m just trying to figure out options for my son’s future and not seeing any at the moment. He has FAS [Fetal Alcohol Syndrome], which affects processing and retention…. He reads at 4th-5th level…. While most of you don’t face such severe disabilities, some do. Perhaps you know someone who thinks he or she cannot homeschool a teen because these problems seem insurmountable. They are not. Homeschooling is a great option for students with disabilities. Parents can creatively customize an education around a child’s talents as well as their needs. For instance, parents can tailor curriculum and activities around a teen’s interests. Families can integrate therapies into the day, rather than tackling them after school when everyone feels tired. High School Credits, or Carnegie Units, are typically awarded for completing a course of 120-180 hours of work, or completing a textbook, or completing a course from an accredited program. When a student cannot do standard high school level work, you can still award high school credit. You may award credit if the student has a documented disability and meets other criteria. Public schools do this for disabled students. There is no reason homeschooling parents cannot. Keep reading to learn more about this and other approaches. Before modifying the content of a course, you have other options. Modify how you teach: shorter lessons, more hands-on materials, and more field trips than in traditional schools—just to name a few. Assign more oral presentations and powerpoints and fewer essays for the dysgraphic student. Break difficult tasks into chunks. For example, students struggling with organizing their writing could only produce outlines for their first few essays, to improve their outlining skills. Use high-low textbooks, which provide high-school level content written at an easier reading level. For instance, we used Exploring World History by Globe Book Company (now Globe Fearon, a division of Pearson). Provide audio books or text-to-speech software instead of assigning only silent reading. Teach your student to use dictation software and other assistive technology. Struggling students, as well as functionally disabled students, are given high school credit and graduate from public high schools all the time. Therefore, in special cases, one should apply similar criteria to homeschool students who have a documented learning disability. For example, if a 10th-grade student is capable of doing only 6th-grade-level math, and that is truly his or her capacity according to the other conditions noted below, then he or she may be awarded a high school credit in math for completing the 6th-grade material. More recently, Faith answered all these questions in an interview on HSLDA’s Homeschool Heartbeat broadcast. I’ve linked it below. Whenever your child starts high school level work— even if it is in eighth grade or younger, you need to start saving information for the transcript you will write later. Save course descriptions of classes your student takes outside the home. Save titles, authors, and editions of textbooks you use. Make careful note of all your science classes with labs. Even if you just throw all this in a folder—in your desk or on the cloud—you’ll be glad you did when your child is in eleventh grade and you’ve got a transcript to produce. I suggest you get Janice Campbell’s Transcripts Made Easy. Writing a transcript isn’t hard. You just need some guidance. Which resources have helped you determine how to award high school credit to a struggling learner? I’ll share a few more below. Please add yours in the comments section. 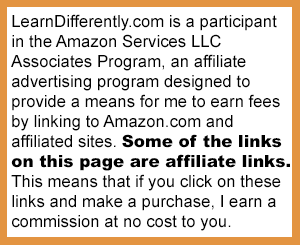 No material connection: I get no benefit from your purchases through the sites below. HSLDA has great resources for anyone considering homeschooling a teen, whether they struggle with learning or not. Exploring World History is one of many high-low textbooks, from Globe Book Company (now Globe Fearon, a division of Pearson). For more examples of accommodations and modifications, see the handout for my talk on Helping Teens Overcome Learning Challenges, and my four-part series on accommodations for writing. Want a professional-looking transcript and guidance on the way, without doing all the layout yourself? Home Educators Asociation of Virginia offers their transcript service. Faith Berens’ interview on HSLDA’s Homeschool Heartbeat broadcast. *Faith Berens, “Homeschooling Your Struggling Learner Newsletter,” 4/14/11. Thank you for asking. Sign up here, please: http://www.learndifferently.com/publications-2/newsletter/ You should get a link to my Goal-Setting Guide in the automatic reply. If you don’t see it, check your spam filter, please. Jenn, I think I replied via email. If not, I’m sorry. I don’t know if a way to look into the books. I would email them to ask for an examination copy or a pdf of sample pages.